Want to stand out in a crowd and be able to disappear in the woods or desert? 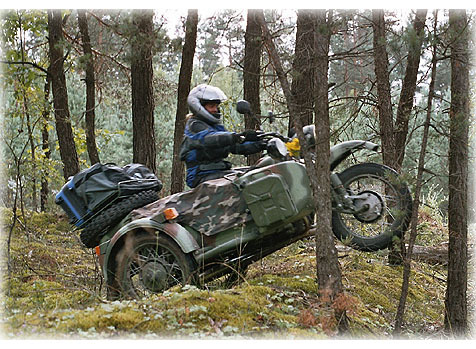 Try the Ural Gear-Up. 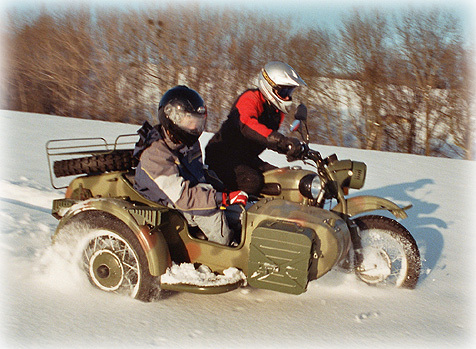 Just like its cousin, the Sportsman, with its on-demand sidecar drive, Gear-Up’s origins trace back to the military past of the Ural motorcycle family. The Gear-Up combination is as tough as a Russian AK-47! Despite its clearly military upbringing, the Gear-Up is equally fit for more peaceful missions, such as fishing or hunting trips. If fishing or hunting is not your forte, you can still amaze your friends with the motorcycle’s ability to blaze through mud, sand and snow… Did we mention its irresistible camo paint schemes?